Experience the Tower of London’s long and stormy history. Make your own way from the coach to the Tower and enjoy priority entry through the group entrance. Once inside, explore independently, take an audio tour (Full tickets and headsets included in price) Learn the Tower’s origin story of 1066 and how it evolved from William the Conquerer's stronghold to a royal palace, armory, royal mint, prison and gruesome execution place. 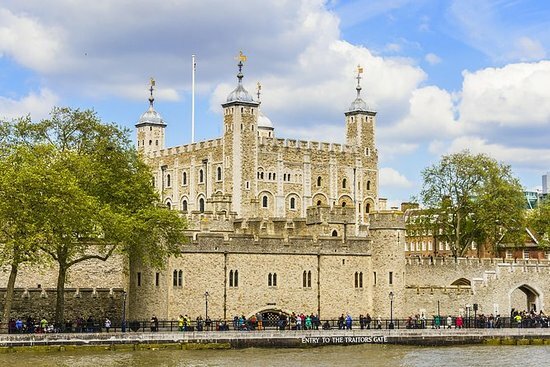 Pass under the famous ravens that perch near Wakefield Tower and lose yourself in myth and history as you visit the White Tower and its Royal Armories collection, the Bloody Tower and Traitors’ Gate. Hear the tale of Anne Boleyn, Henry VIII's unfortunate second wife, who passed through Traitors’ Gate in 1536 and was quickly tried for adultery and executed. Walk to Tower Gate, the execution site where Boleyn and many others met their fateful ends. Despite its chilling reputation, the Tower of London has also been the cradle for the British Crown Jewels since the 14th century. Get a close-up look at this remarkable regalia, the ultimate symbol of the British monarchy and the centerpiece of coronations since 1661. Don’t miss the famous 105.6-carat Koh-i-Noor diamond. After you've visited the major sites, stroll along the Wall Walk and head into the Medieval Palace to admire the beautifully reconstructed spaces. Take your time soaking up this cornerstone of English history. To download the Booking form please click the button to access all the forms and scroll down to find the Tower of London form.